INTRODUCTION: Upper endoscopy (UE) is essential in the diagnosis and treatment of complications after Roux-en-Y gastric bypass (RYGB). Patients who have undergone RYGB present with a variety of functional (nausea, pain, and reflux) as well as obstructive (vomiting and dysphagia) symptoms. 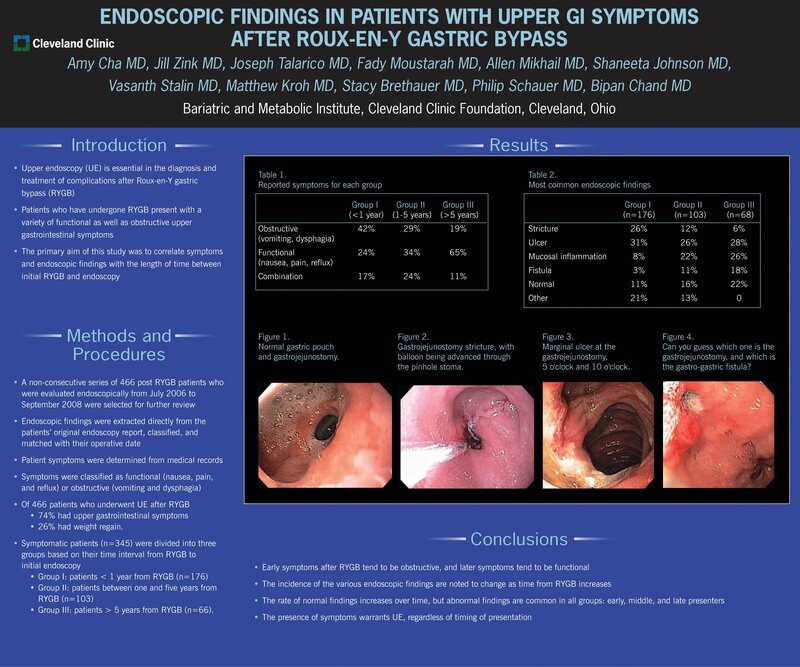 The primary aim of this study was to correlate symptoms and endoscopic findings with time of endoscopy after RYGB. METHODS AND PROCEDURES: Records between July 2006 and September 2008 of patients who underwent UE after RYGB were retrospectively reviewed. A non-consecutive series of 466 morbidly obese patients were endoscopically evaluated after primary bariatric surgery between July 2006 and September 2008. The endoscopic findings for this cohort were extracted directly from the patients’ original endoscopy report, classified, recorded, and matched with their operative date. RESULTS: Of 466 patients who underwent UE after RYGB, 74% had upper gastrointestinal (UGI) symptoms and 26% had weight regain. Symptomatic patients were divided into three groups based on their time interval from RYGB to initial endoscopy. Group I were patients less than one year from RYGB (n=176). Group II were patients between one and five years (n=103). Group III were patients greater than five years from RYGB (n=66). Group I symptoms were obstructive 42%, functional 24%, and combination 17%. Group II symptoms were obstructive 29%, functional 34%, and combination 24%. Group III symptoms were obstructive 19%, functional 65%, and combination 11%. Common endoscopic findings are listed in Table 1. Abnormal endoscopic findings were multiple in 10% of Group I, 28% of Group II, and 10% of Group III. CONCLUSIONS: Early symptoms after RYGB tend to be obstructive and later symptoms tend to be functional. Although endoscopic findings were noted to change over time, our observation is that the presence of symptoms warrant UE regardless of the timing of presentation post RYGB.